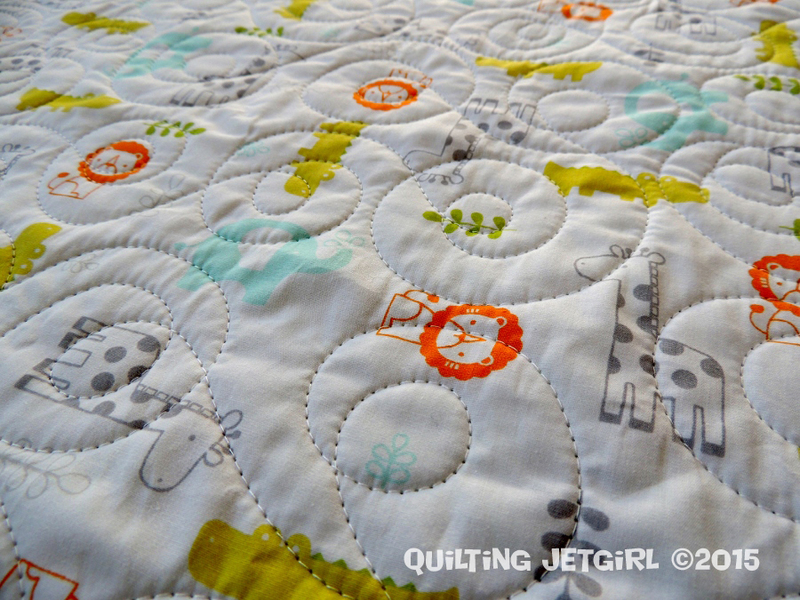 I published a tutorial a month ago on how to turn fitted crib sheets into quilts. 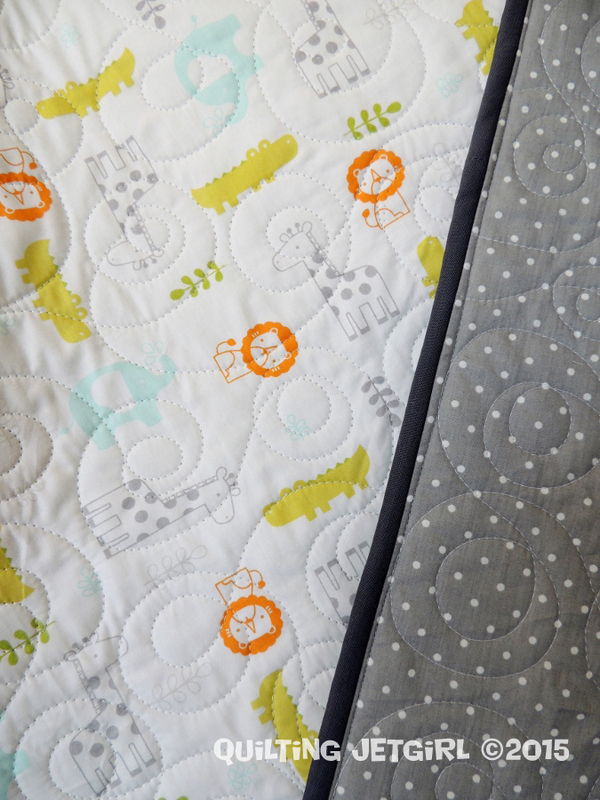 I had been approached by people interested in having a very coordinated baby quilt to baby sheet option, and it worked out surprisingly well: there is a lot of fabric in a fitted crib sheet. Since then, I have purchased several sets of pretty cute fitted crib sheets with the intention of whipping up quick baby quilts to list for sale in my Etsy store. Yesterday afternoon, I decided to see how long it would take. 2.5 hours from start to finish. Not too shabby! This quilt is made from Circo 100% cotton, 200 thread count sheets. The top is the Snoozin Safari sheet and the back is the grey dot sheet. I picked up both from Target for $9.99 each. I bound the quilt with 3/8 yard of a Kona solid (Titanium, I believe), I used Quilter’s Dream Green batting, and 50wt Aurifil white for the quilting. I quilted an all over swirling and overlapping loop pattern on my long arm. It went surprisingly quickly; I think I am really getting used to the long arm. If you are ever in need of a super fast baby quilt, I highly recommend going to take a look at fitted crib sheets in a local store. Especially if you have a friend who has registered for specific crib sheets / theme… you might just be a rock star for making such a super coordinated (albeit easy) quilt! That sounds so fast, I don’t think I would manage it quite so speedily! But still, such a good idea for a gift. What a really fun way to create a matching set – using the store brought sheets! Nice! 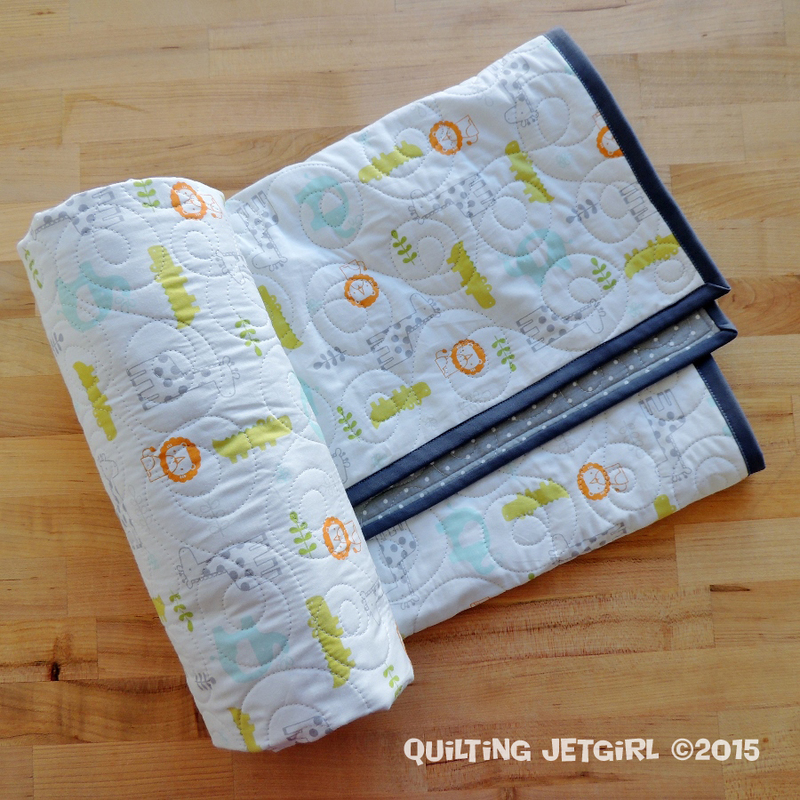 Your quilting and binding are beautiful! Are these pictures of the pre-washed or washed quilt? I love that it’s such a fast finish – and cute too! Great idea!! It would be fun to coordinate with the theme!! I think my favourite quilts yet are still whole cloth quilts … I love the idea of using a sheet set! This is a great idea. I’m not sure how I missed your previous post on crib sheets! I would have never thought of this, but it’s a genius idea. 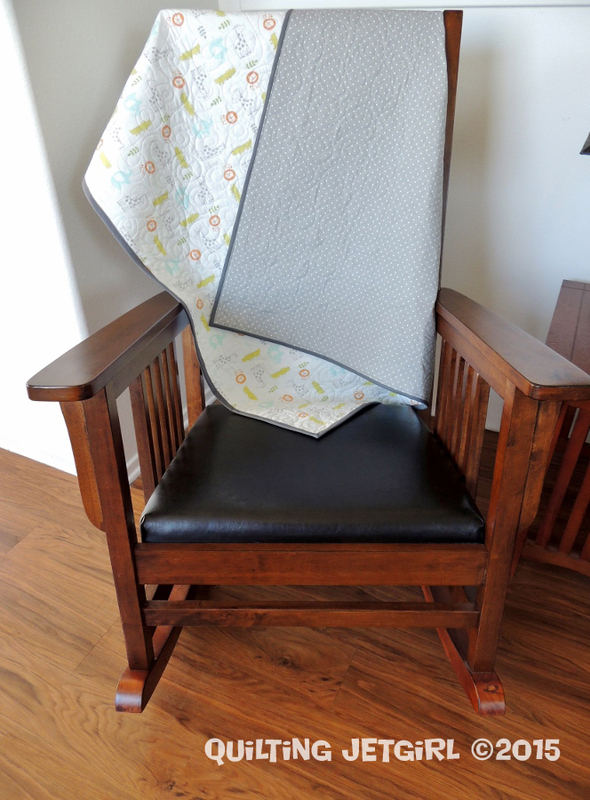 The idea of a coordinated quilt is very appealing to young moms, and this makes it an affordable option. You must be pretty comfortable on the long arm, since your quilting looks spot on. Absolutely darling! And super fast. Thanks for sharing. I think these are so clever. I just found out my boss is pregnant. I was thinking of just making some burp cloths but this might be better if I can find out more about the nursery. BTW, do you use a panto for the loop quilting pattern or do you free-hand it? I really like that and think I want to try something like that on my strip quilt. This is a really cute idea for a baby gift! I love the IDEA of giving all my pregnant friends quilts, but the reality is I don’t have the time to spend making that many. I REALLY Love the idea of doing this for baby showers, etc. for the matching crib sheet set and so forth. Genius Yvonne! I may have to crack your idea open for some new little ones I know that will be arriving! Those are great combinations you selected as well! Also, you’ve been talented from the beginning on the long arm but just as with anything and anyone, you really can see your stitching improvements from your first post to now! Loving it!